Capt. Simran Ghumman (left) and First officer Maneesha Nambuge. In recognition of International Women’s Day, SriLankan Airlines operated its first all female crew flight from Colombo to Singapore and return.UL306 of March 8 landed in Singapore carrying more than 170 passengers onboard. 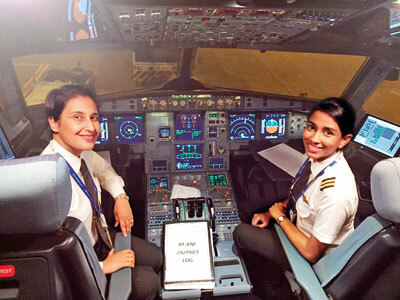 The flight was piloted by Captain Simran Ghumman and First Officer Maneesha Nambuge accompanied by purser Miranda Rodrigo and the cabin crew – Lakmini, Sumudu, Onella, Shehani and Dushmanthi.